In some cases, you may need to completely change the root folder (the working directory) that Minecraft uses — this is now possible with the new launcher. 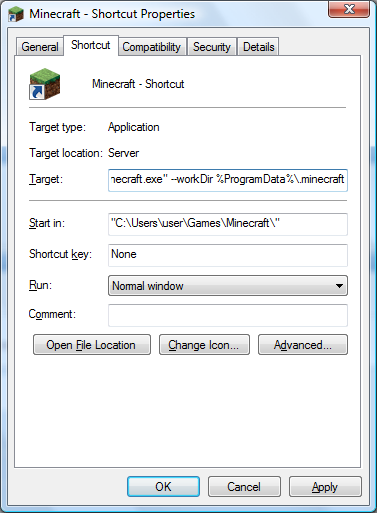 Right click on Minecraft.exe or Minecraft.jar (the launcher) and press "Create Shortcut". Right click on the new shortcut that gets generated and press "Properties". Press 'OK' and then run the shortcut, and Minecraft should launch. Note: If you should ever need to move the actual Minecraft.exe file (not the shortcut), you will have to follow these instructions again.